Buying a new phone can be rough. With a fancy new user interface usually comes hundreds of software features and you may not have the slightest clue where to start. Don’t worry. Your friends at Phandroid got your back. In this post, we’ll be exploring the first things you should be doing with your phone as a brand new Samsung Galaxy S5 owner. Because your smartphone holds a heap ton of personal information, your first act of business should be securing your phone. Whether you want to do that with a password (high security), pin (medium security), or pattern, the Samsung Galaxy S5 makes this process a little less painful with the inclusion of a fingerprint scanner in the home button. Executed with a simple swipe, that’s all you’ll need to unlock your phone and keep unwanted eyes out. 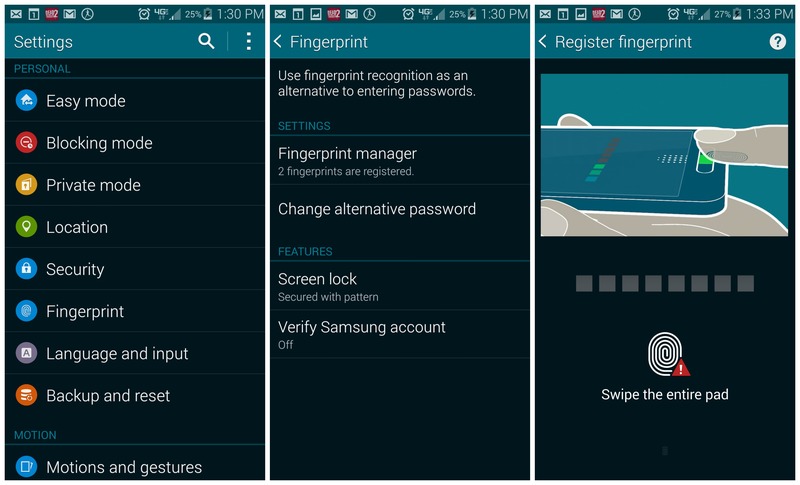 Simply open up the Settings app, then scroll down and select “Fingerprint.” Choose the top option “Use fingerprint recognition…” and from there, you’ll be walked through setting up the fingerprint scanner. Protip: Samsung’s way isn’t the only way to register a print. Instead, try hold the phone naturally with 1 hand, and swipe at an angle with your thumb. 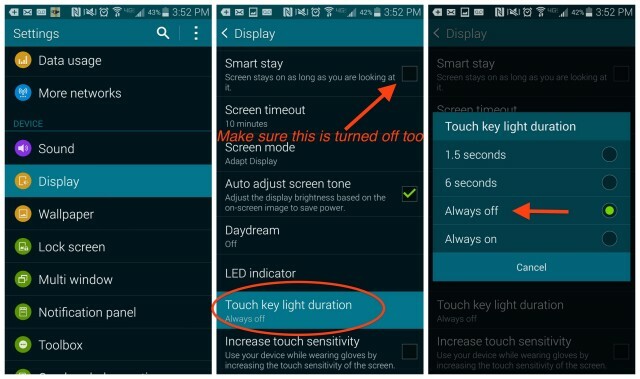 This will ensure you can easily unlock your phone using 1 hand, instead of 2 like in Samsung’s demo. A hundred times more convenient. Don’t forget that you register up to 3 fingerprints, so feel free to register more prints using the 2-handed method as well. Now that your phone is secure and you’ve effectively guaranteed nobody will make it past your lockscreen, now would be a good time to set up your lockscreen with some helpful contact information. This will ensure that, in the event you ever lose your phone, a good Samaritan will have all the info they need to contact and return it to you safely. 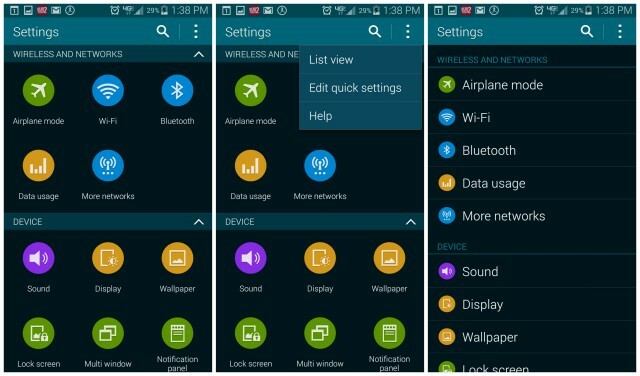 Samsung kinda threw everyone for a loop when they introduced their new Settings layout for the Galaxy S5. Instead of the normal list we’ve been since Android 1.0, they’ve gone ahead and chosen a grid layout. Cluttered and difficult to find what you’re looking for — don’t worry, there’s an easy way to get the traditional list view back. Simply press the 3-dot menu button in the upper right corner, and select “List view.” Now you can enjoy Settings options that are now 100% easier to find than before. 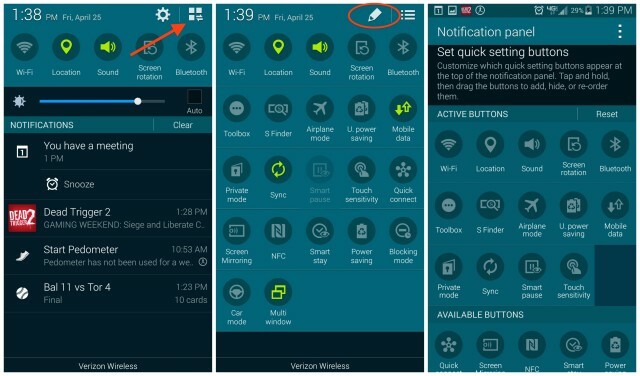 Probably the most important part of your phone’s user interface is the notification area. Pull it down and you’ll notice handy shortcuts at the top of the phone to quickly toggle commonly used functions like WiFi, Bluetooth, etc.. Samsung’s layout may not be the most ideal (it really isn’t), but you can customize all the little toggles that show up, not only when your first pull down the notification panel, but in the secondary area as well (see picture 1). We recommend getting rid of things you never use often (like screen rotation or location), and replacing it with Power saver, multi-view, and toolbox — handy features you’ll need quick access to. Everything else, just organize and place below the first row of the “active buttons” section. 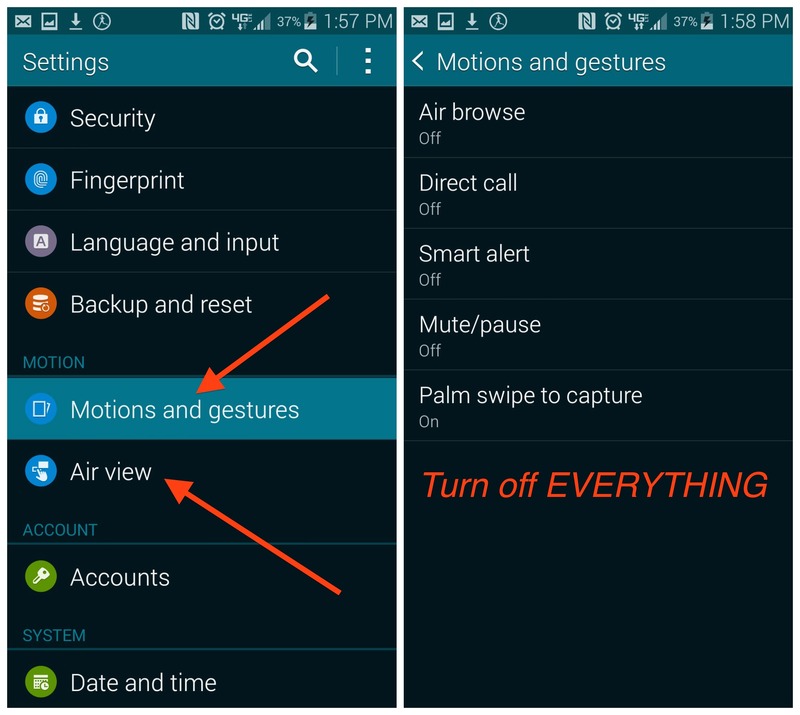 With so many options, it’s worth taking a minute to set up this portion of your Galaxy S5. 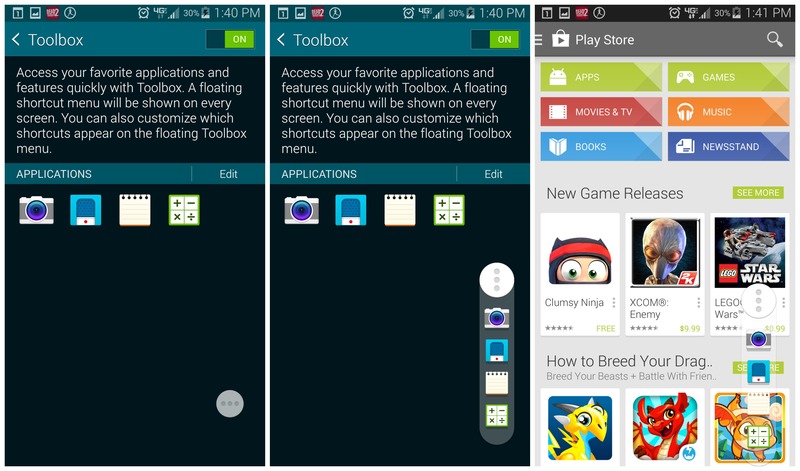 The Toolbox is a floating button of sorts that when enabled, can give you shortcuts to apps you use often. 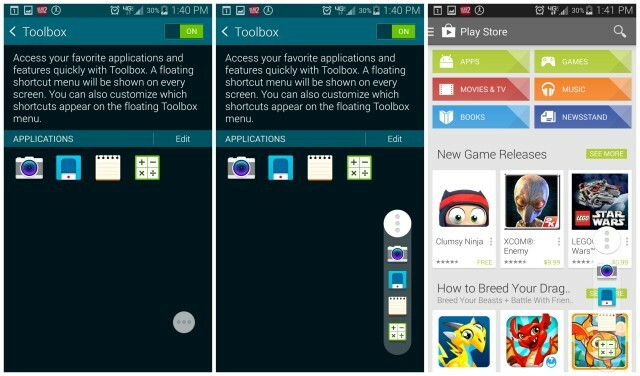 Useful for quickly jumping to apps without even having to visit your homescreen, this too can be custom tailored to suit your tastes. Simply open up the Toolbox option from the Settings app, turn it on, and click the “edit” key to add which ever apps you like. When turned on, you can quickly summon the Toolbox by simply long pressing the back key on your phone. 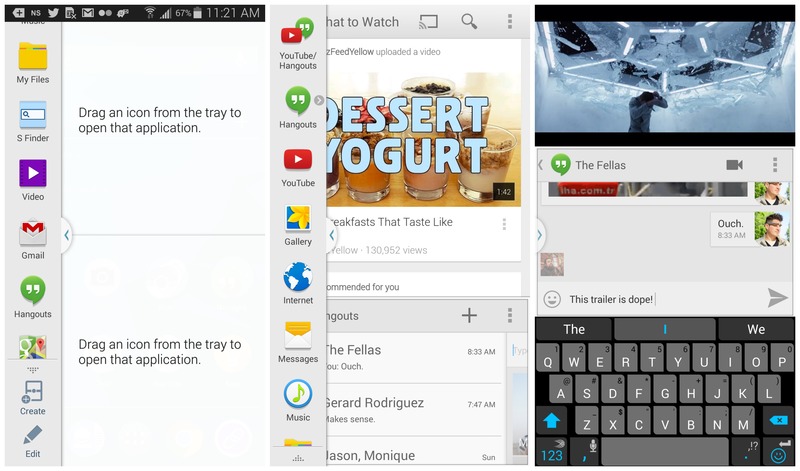 It’s probably the coolest software feature found on the Galaxy S5, and can be hugely beneficial to power users: multi-window. A TouchWiz feature that allows you to use 2 applications simultaneously, this too will take some setting up for maximum effectiveness. Aside from customizing the drawer with apps you’d like to use along with other apps, you can even setup group shortcuts by clicking on the “create” option towards the bottom of the window. Our favorite group? YouTube/Hangouts for watching videos and chatting with friends at the same time. Fun. NFC — or Near Field Communication — is one of the best things about owning a modern smartphone. Located on the back of your smartphone, there’s a tiny chip that is only activated when in very close proximity to a reader. 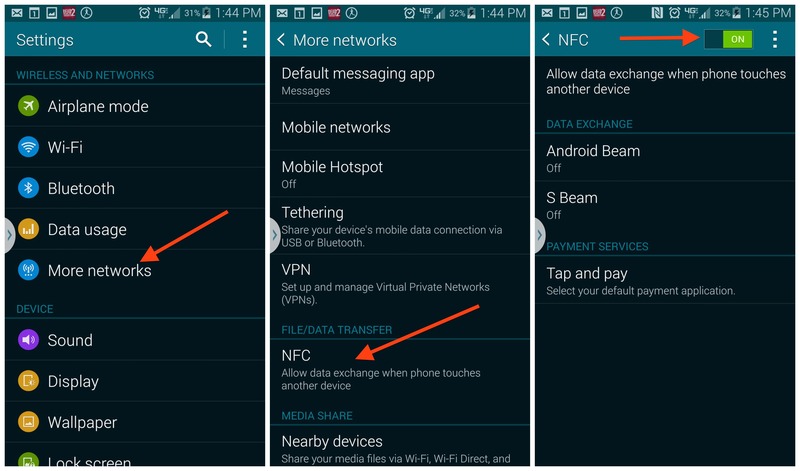 With NFC, you can tap 2 phones together (providing it too is NFC-enabled), send photos via Bluetooth, or pair your phone to something like a Bluetooth speaker, even make purchases at 7-Eleven using your phone (providing you’ve set up Tap and Pay with Google Wallet or alternative payment methods). 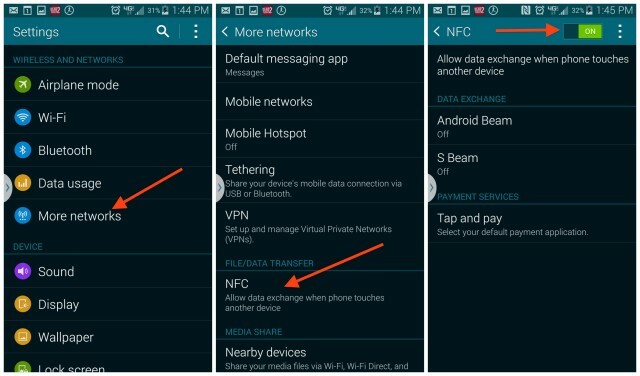 Just make sure that once you turn NFC on, don’t forget to also turn on Android Beam and S Beam for full functionality. Best part about NFC is doesn’t have any impact on battery life, so you don’t have to worry about leaving it on. I talked about this briefly in my Galaxy S5 rant, but one thing some users might notice when using the phone is a slight amount of lag when opening apps. 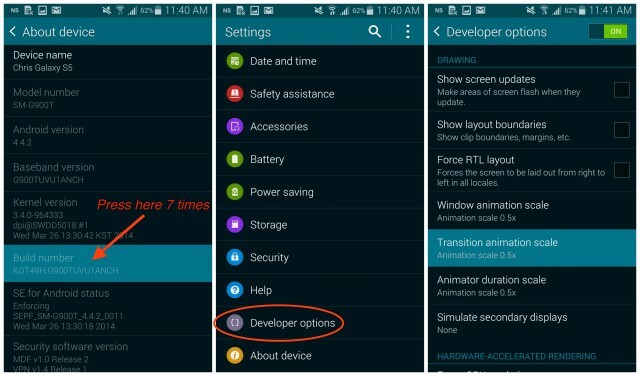 Whether this has something to do with TouchWiz or hardware, you can help “speed” things up by turning off all animations in the phone. Once you’re done, return to the main Settings area and scroll to the bottom. There you’ll find a new option for Developer options. Once inside, scroll down to “Transition animation scale,” and set everything to 0 for a really quick feel (or simply 5.x to speed things up a little bit). Enjoy! 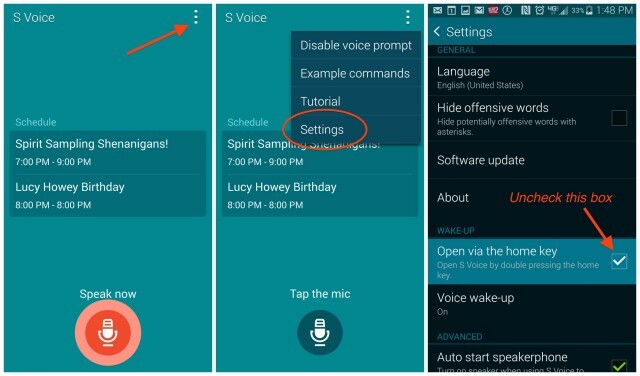 Out of the box, your Samsung Galaxy S5 features a short cut to quickly open up S Voice, Samsung’s own virtual voice assistant app. Because the app is sorta redundant, you may want to stick with Google Search which we’ve found to work better all around (executed by long pressing the home button). Not only do we never feel the need to quickly access S Voice (you can always find it in your app drawer), but it can actually slow your roll. How? When the shortcut is enabled (executed by pressing the home button twice), your phone will always wait for a second key press, every time you simply want to return to your home screen. Some might not even notice the delay, but for those looking to increase the speed and responsiveness of their $600 investment, just turn the dang shortcut off. 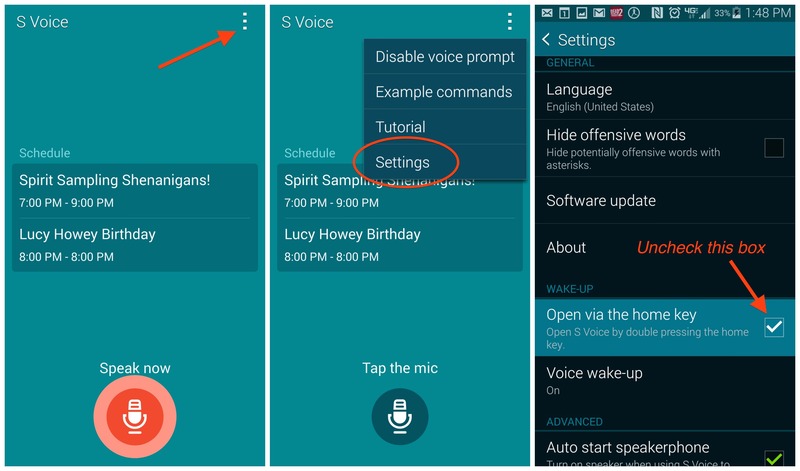 You can do this simply by opening up the S Voice application, going into its settings by clicking the 3-dot menu in the upper right. Then scroll down to “Open via home key” and turn it off (uncheck the box). Boom. Another laggy shortcut disabled. The Galaxy S5 features a hand-dandy “Power saving” mode, but like most things, it will take some tweaking to suit your needs. 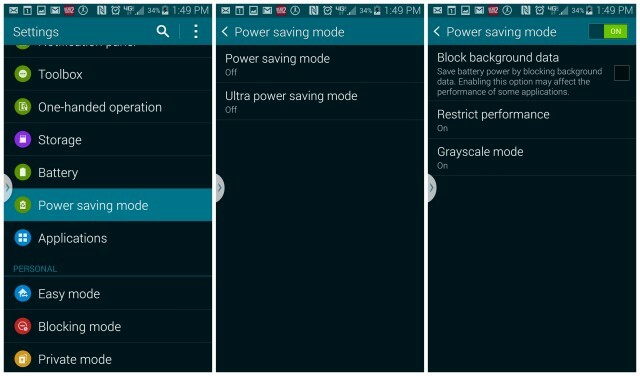 For instance, by default, power saving mode goes all out, blocking background data, slowing down performance (making the phone slower when scrolling through menus), and finally, can make your phone display only grayscale (black and white). Altogether, these are pretty extreme measure to simply squeeze a little bit of extra battery life from your phone. Because of the amount of messaging applications that rely on background data to function — apps like Hangout, Facebook Messenger, Kik, etc. — we don’t think turning off background data is worth the trade off. Instead, options like restricting performance and grayscale mode will allow you to use your phone as normal, while ensuring your Galaxy S5 is using only a minimal amount of battery while being used. I mean, you don’t need color or a silky smooth UI to chat with friends or send a tweet, right? Because even LED lights can drain your smartphone’s battery, turning off the LEDs that light up the multitasking and back buttons could help conserve precious juice. One of the coolest parts about the Galaxy S5 is they actually give you the ability to turn them off. 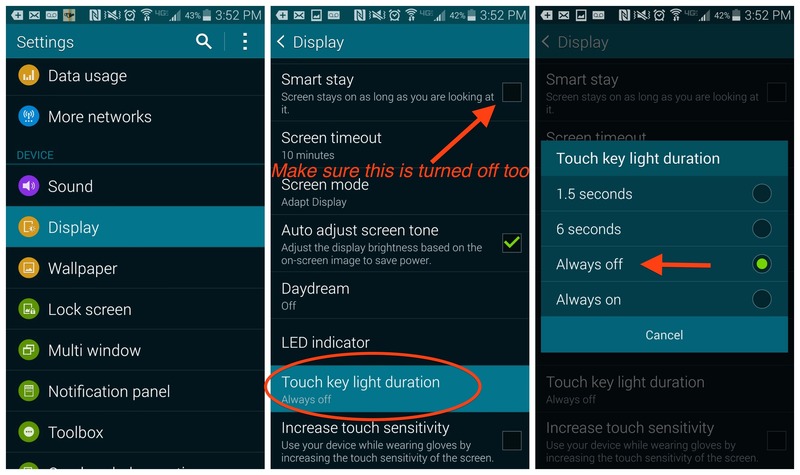 Simply head to your Settings app, scroll to the Display option, then select Touch hey light duration and switch it to “Always off.” Hopefully you don’t forget where those keys are located in the dark (but we think you’ll be just fine). 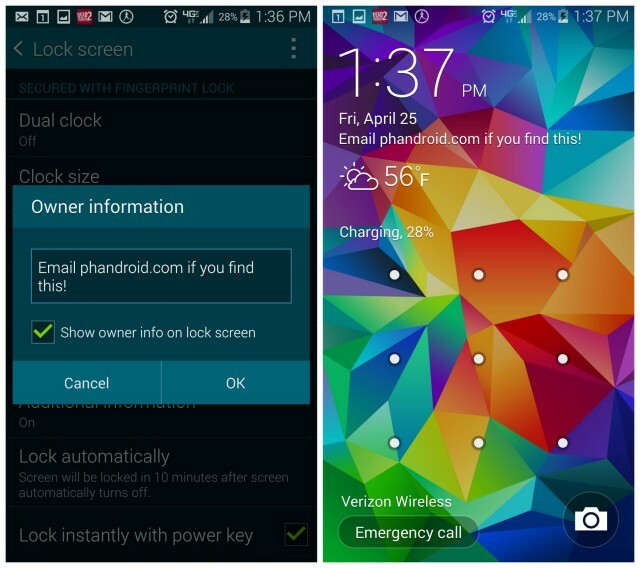 When you first get your phone, we’re sure the first thing you noticed was that intense lockscreen. Earlier in this post we told you how you could/should add your contact information in the event you lose your phone, and now we’re going to talk about how to tweak it for battery life. The Galaxy S5 features a unique Super AMOLED display and without getting too technical, that means unlike traditional LCD, the Galaxy S5 doesn’t require much juice to light up the black pixels on the phone (I mean, they’re already black, right?). What that also means is if you use a black background on your lock screen, your phone only has to light up the time, date, and other small text. Problem is, Samsung doesn’t supply an all black wallpaper, so you’re going to have to find your own. Don’t worry, you can click here for one. Once downloaded, head into your Settings, and jump into Wallpaper, click Lock screen, and select “more images” from the wallpaper chooser, and look for that black wallpaper you just downloaded from your Gallery. While this means your lockscreen might not look as cool or flashy as the next guy’s, you’ll enjoy a slightly longer battery life if you’re one of those types who are constantly checking their phone for the time or new notifications. You’re welcome. 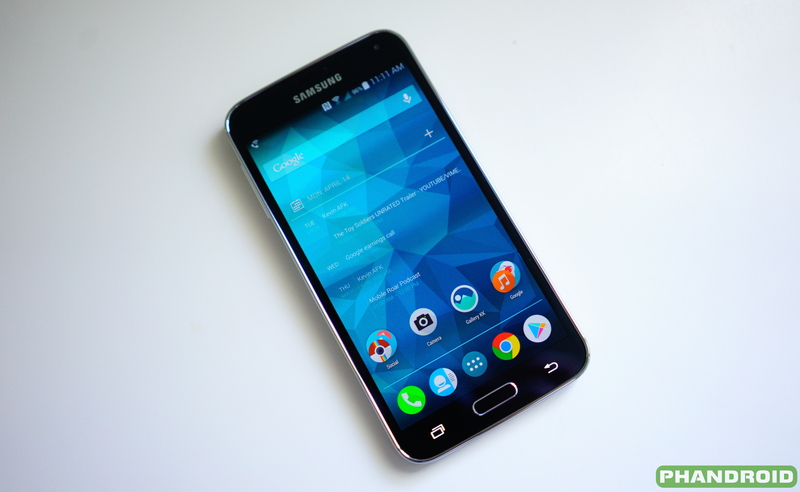 The Samsung Galaxy S5 has a boatload of software features. While some are kinda neat, we found that we didn’t actually need any of these to further the enjoyment of our phone. Instead, we found that turning them off, while unproven, should help battery life, even if only slightly. I mean, your Galaxy S5 watching to see if your eyes are looking at the display has got to eat up some battery, no matter how minimal. 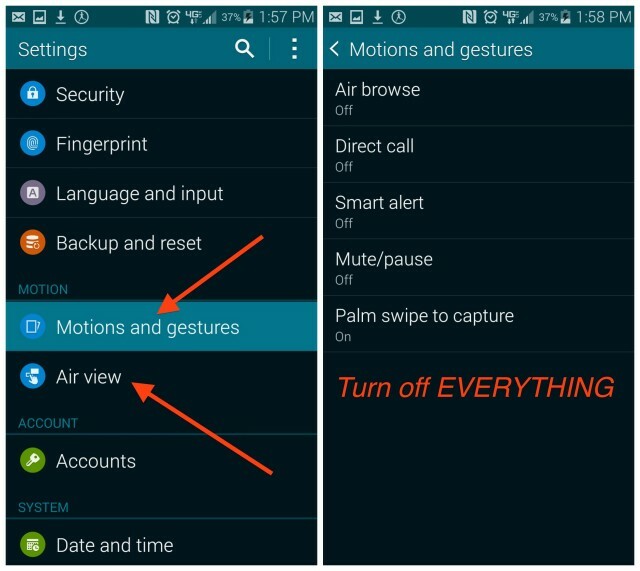 Simply jump into your Settings app, scroll down to Motions and gestures and turn off everything you don’t think will be very beneficial to you. After that, do the same with Air view and enjoy a possible slight increase in battery. Your phone already comes with Google+ pre-installed. Only thin you have to do is open it. During the small set up process, you’ll be asked if you want to back up your photos to Google+. Of course you do (probably only on WiFi though). And don’t worry about online drama, you don’t even have to use Google+ as a social network. Just set it and forget it. This way if you lose your phone (or move onto a new one) all of your photos and videos will be securely tucked away in the cloud. Google+ will store an unlimited amount of photos at 2048 pixels wide (roughly 3MP in size). If you don’t want your quality to suffer at all, you can always store them at full size, but that will eat into your Google Drive storage (about 15GB when you include Gmail). To help save battery life, there’s also an option to only sync when connected to a charger — we recommend using that option. And that should pretty cover everything you should do as a brand new Samsung Galaxy S5 owner. Of course, this is by no means an exhaustive list, but we think we covered most of the basics. Don’t forget to come back tomorrow for our Galaxy S5 Tips and Tricks post, detailing all the cool things you can do with your shiny new Galaxy S5. Should you have any more questions, feel free to drop a comment and/or check out our Galaxy S5 Forum on Android Forums.com. There you’ll find people who are always willing to help with your questions or issues, no matter how small. Cheers!